The Unusual Eating Habits of Successful People #Infographic ~ Visualistan '+g+"
Eating is just one of those things that makes the majority of us happy, and particularly within a busy lifestyle, ‘comfort’ eating is now a popular term to describe food habits which make you happy. For some of us this may be a sweet treat, but others crave particular savoury foods in order to keep them going. We all have our unusual eating habits which could be anything from mashed banana on toast to soy sauce on chips, but what about the unusual eating habits of the rich and famous? Our latest infographic describes just this, ranging from Steve Jobs who would only eat one type of food for weeks at a time, such as carrots or apples, to Hilary Clinton who eats a fresh jalapeno every day in order to boost her immune system. 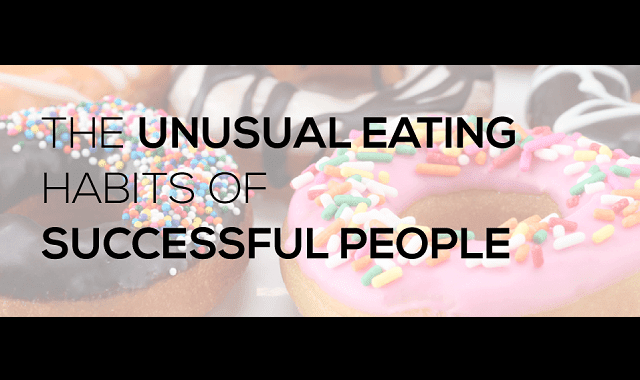 Take a look at the infographic below to find out more about what these successful people like to eat.